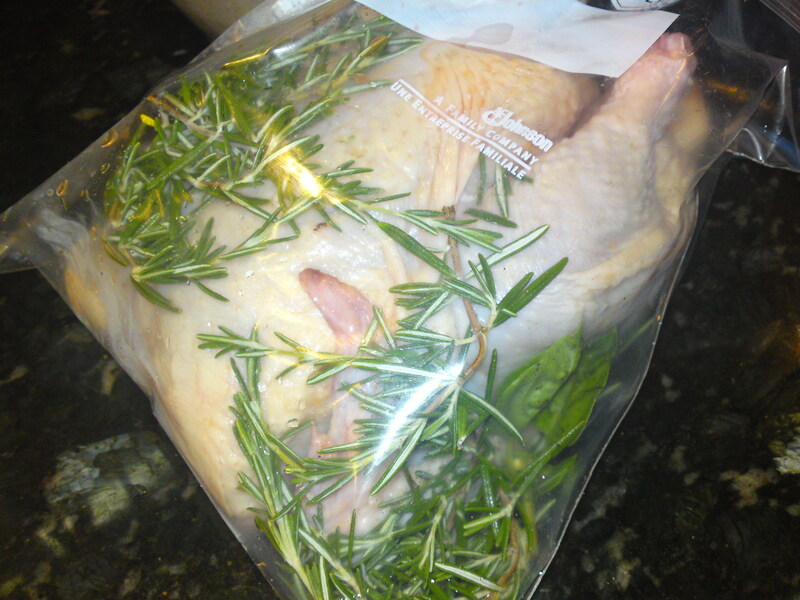 The plumber’s method: take a whole chicken, put it in a Ziplock with fresh herbs, cover it with water and seal it up. After two days in the refrigerator, drain the water and herbs and roast or barbecue as you usually would. It’s rare that my husband and I cook a bird without marinating it, but we’ve never let it “bathe” for two days, and never in water. I couldn’t wait to give it a try. All I had on hand were frozen chicken breasts, which I promptly defrosted and submerged in rosemary, basil and water. Two days later, we grilled them up. Wow. The meat was perfectly infused with the herb flavors. And it was moist, or at least moister than chicken breasts usually are. Next, we experimented on a whole chicken. I harvested a good amount of fresh rosemary and basil from the garden, which I crushed in my hands to help release the flavors. The chicken went into the gallon Ziplock first, then 1/3 of the herbs into the cavity, the rest loose in the bag, and then a handful of unpeeled garlic cloves I’d smashed with a mallet. I topped it off with cold water. 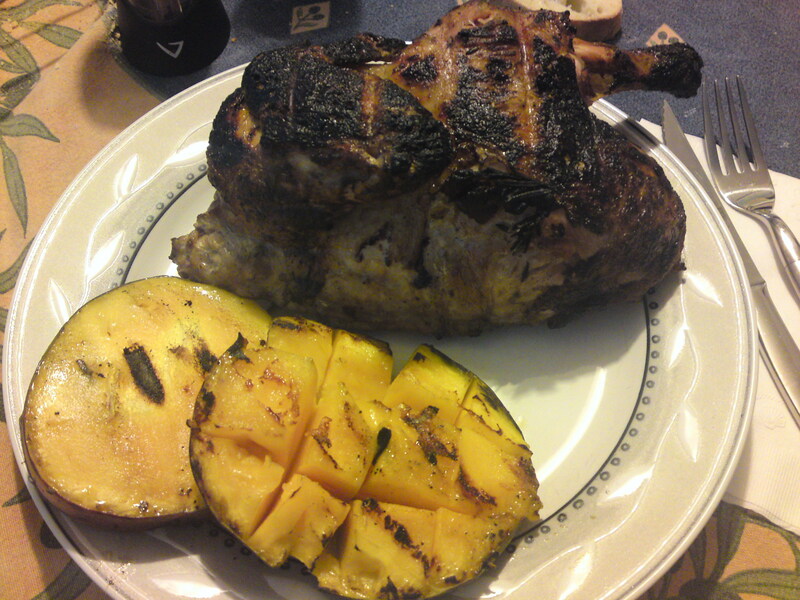 Two days later, Stefano grilled it up. Although the results were pleasing, I couldn’t taste the herb flavors anywhere near as much as I could in the chicken breasts. (Seems reasonable, given the thinner cut of meat.) Still, with a side of grilled mango, this herb-bath chicken made a nice dinner, and the leftovers were the perfect addition to a Bejeweled Summer Salad (recipe to follow). I’m not done experimenting with this. First, I like what Wikipedia had to say about brining, and I’d like to add some salt to the bath. Online, there were plenty of warnings not to let your chicken brine for more than a few hours – which is not enough for the herbs. I figure I’ll either use a lot less salt or add the salt during the last few hours. Maybe the brining process will help infuse the herb essences deeper into the meat. I’d also like to experiment with different liquids. Beer perhaps? White wine? Maybe toss in a quartered lemon? I’ll let you know how it goes. And if any readers have experience with any of these processes, I’d love to hear your suggestions. I brined turkeys for last Thanksgiving and they were excellent! The hardest part was finding a zip-loc bag big enough to fit a turkey in. I ended up finding them at Williams and Sonoma of all places. A little pricey (of course) but I was just too excited to have found them not to purchase them! They came with a couple of smaller bags, so I might try this chicken bath thing with those! TurkeyS? Plural? You go girl! I admit, I have yet to cook a turkey — in any fashion. Blame it on prior years of vegetarianism or pehaps that the big birds usually turn out on the dry side… Perhaps brining is the answer. I’ll start with truly brining a chicken and move up from there. I see turkeys in my future! Rinse turkey and place in a large, heavy plastic zip-lock bag. Place turkey, in bag, in a large stock pot. In a large bowl, add water, salt and honey, mixing until salt dissolves. Add 1 bunch of thyme, garlic and pepper; blend. Pour brine into zip-lock bag with turkey. Gather bag up tightly around turkey and secure it so that as much of the air as possible is removed and turkey is covered with brine. Place the pot in refrigerator for 24 hours. Position a rack in bottom third of oven, and preheat oven to 350 degrees F.
Drain turkey, discarding brine. Pat turkey dry inside and out. Pour freshly squeezed lemon juice into turkey cavity and place the squeezed lemon halves along with remaining bunch of thyme inside turkey cavity. Tuck wings under the back and tie legs together with kitchen string. Place turkey breast-side down on a rack in a large roasting pan. Rub bird all over with olive oil. Roast turkey for 1 hour and baste with chicken broth. Continue to roast for 1-1/2 more hours then remove from oven and turn turkey breast-side up. Return to oven and continue roasting, basting with chicken broth every 30 minutes until done. I had two large soup pots to stick the birds in, feet up, in the brine. It was quite the sight in my fridge. Thanks for the hints on an easier and cheaper way to go Jeremy! I also believe we ended up flipping the birds over as the recipe calls for. I’m not sure how one or the other, or both, did not end up on the floor. But they survived the flip! Also, it is a tradition that my grandmother created to put a whole apple in the neck cavity- so that is what I did. Even a low level of salt is absolutely necessary for brining. What you are doing isn’t really salting the chicken while brining (but that’s an added benefit), but you are using the salt in the water to create an equilibrium in between the brining liquid and the cell walls, via osmosis. And by doing that, which requires salt, the herb flavors tend to go along with the ride. The long and short of it is if you don’t use salt, you will be a very, very mild herb flavor–cause it won’t penetrate more than a few microns. If you do use salt, then through cellular osmosis the flavor of the herbs (given enough time, but usually less than a day for a chicken) will penetrate the whole bird. “Look for a triangle-shaped label with rounded corners made of three arrows, then check the number in the center to determine what type of plastic is in the container. My favorite thing about whole chickens that many people overlook is you have *at least* three major different textural and flavor areas to work with–the skin, the breast meat, and the rest of the bird. So when planning a recipe, it’s really useful to think about these factors, especially since they can all ‘finish’ at wildly different times. Dark meat can finish before the breast and skin, leaving the dark meat delish but the white meat chalky and the skin limp. 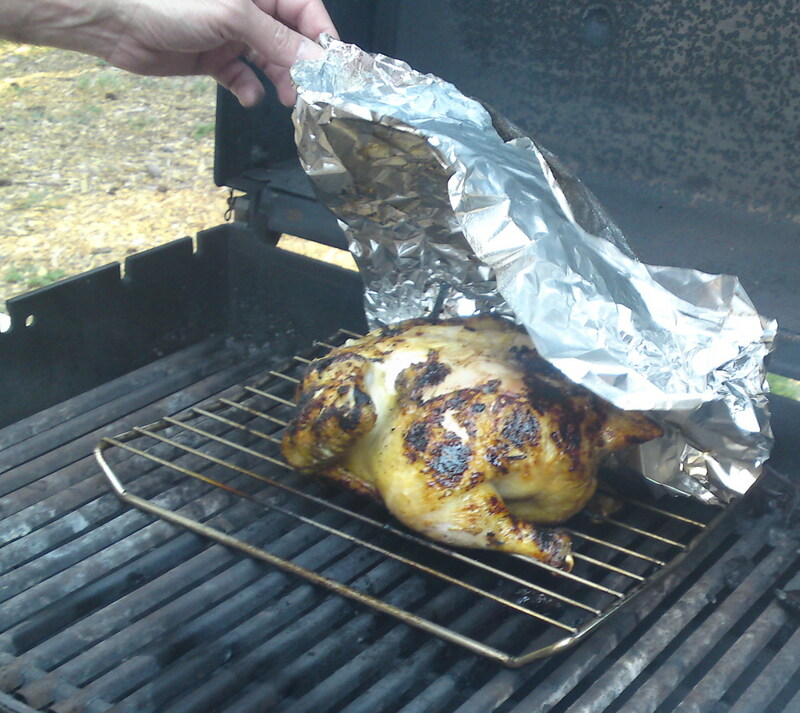 Breast and skin can finish first leaving pink, tough dark meat. However, even though I’m 80% vegetarian nowadays, roasted whole chicken is my favorite thing in the world. Brine the bird with rosemary and sage, use a small amount of butter and pepper on the breast, stuff with whole lemons that have been pricked to release the lemon juice, and roast at 425F-475F for almost an hour. I love the recipes, Amanda and Jeremy. Even more than that, I love this feeling that I’m in the kitchen cooking and experimenting with a couple of friends even though we’re 30 or 300 miles apart! Whole chickens are on my shopping list. Lemons in the fridge. Plenty of sage and rosemary in the garden. Sounds like I’m brining anothe chicken this week! Will let you both know how it goes. Thanks for the suggestions!